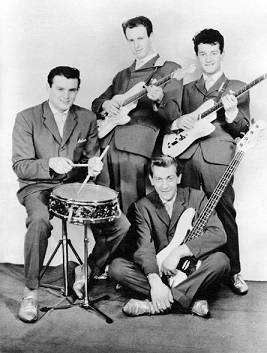 Jerry Wilcock (lead guitar), Mick Eyre (rhythm), Walter (Bill) Bonney (bass) and Tony Hinchcliffe (drums) backed first Johnny Theakestone, then Bernard Jewry in the 'title role' of Shane Fenton. Onstage, the Fentones featured a strong, distinctive and driving sound played on their matching white Fender guitars. After regularly hitting the nations charts backing Fenton on a succession of (initially anyway) home-grown hits it was time to see if his more than competent backing group could find their own feet as had others including, most notably, the Shadows. As Parlophone began to tailor the singers records as to how they believed they should sound, the Fentones were left more or less to their own devices. Their 'solo' recordings ably demonstrate a confident group adding some neat touches to their playing, Wilcock especially producing some tasty licks, yet they managed to retain a commercial foot on the ground. With a harsher edge than some of their counterparts this may explain why the Fentones have been cited as a possible influence on both the Challengers (from California) and Australia's Atlantics - both modern "Surf" instrumental groups! Parlophone producer Ron Richards, who was often assigned to the more rock 'n' roll orientated acts on the label overlooked the Fentones recording career, four cuts making up the brace of singles that dented the lower reaches of the charts during 1962. First up was the franticly-paced "The Mexican" which came about when a representative of Jennings Music introduced the tune's composers to group members who liked the tune. It introduced a variant on the recurring theme found in early-60's UK instrumental rock which evoked the American Wild West. This tradition started with a string of early Shadow's cuts ("Apache", "The Savage", "The Shadows" EP, "Geronimo") through the Federals' ("Boot Hill") to the Raider's ("Dodge City"), counting any number of Joe Meek productions along the way, most notably with the Outlaws. Becoming part of this heritage did not guarantee a massive hit and this interesting single stalled at number 41. The flip "Lover's Guitar" was a Billy Mure album track which became a stage favourite. 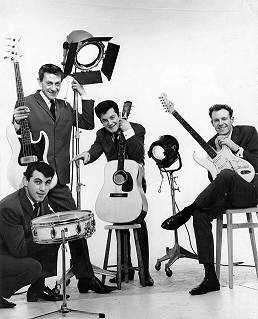 The Fentones, 1963: George Rodda, Bill Bonney, Mick Eyre, Jerry Wilcock. Originally, a thematic version of the Ventures' "Gringo" was recorded as the follow up but left in the can when a cover of Ernesto Lecuona's "The Breeze And I" was released instead. Two takes of this evocative and atmospheric performance were recorded, and at the suggestion of Ron Richards the 'best' received an overdub over the second verse. A Spanish guitar plays the melody of the second verse behind which Jerry Wilcocks' electric lead guitar really takes flight. As Wilcocks' echo unit was not functioning properly Shane Fenton (who was helping out on the session) operated the controls to the studio's own echo to 'swell' the sound, while the guitarist helped with extra vibrant tremelo. Finger-clicks for castanets were also dubbed on afterwards, all of which made for an atmospheric cut. The alternate version saw a surprising release on both the Colin Miles LP and subsequent CD compilations. (Click here to hear an extract from the alternate take.) Richards had insisted the group supply their own composition for the flipside, and the two guitarists agonised through the previous night. The finishing touches were applied as dawn was breaking, the title, "Just For Jerry", created out of thin air during its recording. With the idea of an EP or even an LP a possibility, other various tracks were recorded. These included a cover of Dave Brubeck's "Take Five", also "Teardrops", "Caravan", "Raucous" (a Bonney original), "Micks' Tune", the theme tune from the group's 1962 "Swing Along With Shane" BBC radio show plus of course the already mentioned "Gringo". Although "The Breeze and I" charted soon after release that was it, an extremely short-lived and unjust solitary week in the charts at no. 48 before disappearing. "Breeze" proved a hit amongst their contemporaries as well as the fans, even the Shadows" placed their pleasant, airy version on the flip of the chart-topping "Foot Tapper". The Tornados had also recorded a typically intense version for their second release but after hearing the Fentones were ahead of the game their producer Joe Meek shelved it, giving the Fentones a clear run. This was a Fortuitous move for the Tornados, as it turned out; Meek had watched the first trans-Atlantic live television broadcast and penned a tune in homage to the communications satellite that made it possible. Named "Telstar" the tune became a huge global smash and was for many years Britains' biggest selling instrumental. The Tornados version of "The Breeze And I" subsequently saw the light of day on an EP. "Money Honey" was written by Jesse Stone who had started performing at the age of five with his family's travelling Minstrel show. After becoming a composer and arranger at Atlantic Records, Big Joe Turner recorded Stone's "Shake Rattle And Roll" before Bill Haley's later version broke big. He also wrote under the name Charles or Chuck Calhoun. Atlantic boss Ahmet Ertegun credits Stone with virtually creating the sound of Rock 'n' Roll. Stone died in 1999, aged 97 and still composing! For the Fentones, no more releases followed this brace of singles despite recording many more tracks, some of which were later exhumed for retrospective instrumental compilations. 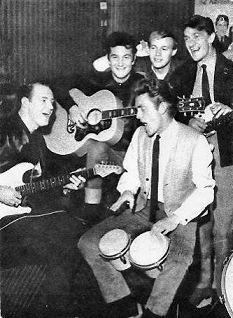 By the summer of 1962 the hits had ceased for Shane Fenton too and although Wilcock, Eyre and Bonney remained Tony Hinchcliffe emigrated to South Africa to play with some of that country's top groups, to be followed by a succession of drummers. George Rodda was selected from the ensuing auditions although historians may be interested to note that the Canadian secured it ahead of an upcoming young man destined to make his mark in the drumming world before long - Keith Moon! Rodda's tenure lasted for around a year before he was replaced by an 18-year old Bobby Elliot in the early summer of 1963. He played live for a few months before being purloined by fellow Parlophone group the hollies to replace their departing drummer Don Rathbone, who was stepping down to become Road Manager. This was toward the end of 1963, when to replace him Don Burrell was drafted into the Fentones. 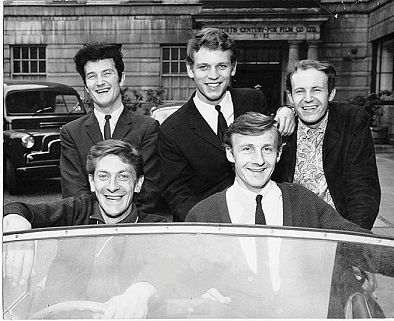 After Shane Fenton turned to management in late 1964 the group continued, still returning to Abbey road on occasion. One cut soon after leaving Fenton was the old Martha and The Vandellas' "A Love Like Yours", another one lost to the EMI vaults. With Burrell, they kept their name while looking for a vocalist. Ex-rocker Duffy Power was developing a nice line in R&B and as he was looking for a good, reputable group at the same time as the Fentones were looking for a vocalist, both teamed up. The group easily adapted to Power's R&B style while still playing their rock 'n' roll instrumental set with a couple of Rockabilly vocals thrown in. Around this time Ginger Baker replaced Burrell and played on the next recordings with Power, covers of the Drifter's "Money Honey" (see "Trivia Spot", above-left) and Lloyd Price's "Lawdy Miss Clawdy". These two tracks have finally seen the light of day on a Duffy Power collection on RPM. Gordon **** , a friend of Duffy's briefly took over bashing the skins until Tony Hinchcliffe returned home to the fold. Group and singer then went their separate ways in 1965, Power joining up with legendary UK bluesman Alexis Korner while the Fentones returned home to Mansfield for a spell before eventually disbanding in September. Bill Bonney emigrated to Canada, backing Ronnie Hawkins on the way to becoming a photographer. Mike Eyre went back to join a London R&B band before once more returning home to a solo act around Mansfield. Tony Hinchcliffe departed once more to South Africa. Jerry Wilcock switched to bass when later joining up with Shane and Iris Fenton in a singing and dancing cabaret act. He today lives in Devon. The Fentones (minus Eyre) re-formed to appear at the 1995 "Pipeline" instrumental convention where the Falcons' guitarist Mike Beddoes subbed on rhythm guitar. At a later convention Bonney returned the favour to the same Canadian group by guesting with them for their take on "The Mexican". You can read more about the legendary Pipeline Convention here. Most recently, Bill attended Bruce Welch's "Shadowmania" show held at the Lakeside Country Club in Frimley, Surrey during September 2002. The following year took Bill to Liverpool and the site of the famous Cavern Club. The name of "Shane Fenton and the Fentones" is inscribed on one of the bricks of the replacement establishment (also called the Cavern), a photograph or two of Bill there proudly showing this off are on the "Gallery" page. Over the last couple of decades, Fentones tracks have been re-issued. "The Mexican", probably their most famous cut, has appeared relatively often such as on 1994's "Instrumental Hits" double-CD set (Knewcd 734), and on various EMI compilations on both LP and CD. But it is in the latter years that a good handful of odd Fentones cuts have seen the light of day for the first time. Oddly, the first rarity to escape EMI's cavernous vaults was included on the definitive Shane Fenton & the Fentones vinyl retrospective from 1982, but not credited as such. This was the only alternate take of "The Breeze and I". The other, selected as the "best" take was of course adorned with the acoustic guitar overdub for release as the second and last single. It's also differentiated by means of a more flamboyant flourish from Jerry Wilcock at its end, and some prefer this take to the released version. The Dave Brubeck number "Take Five" was next, to be re-issued on Colin Miles' excellent "20 Classic Instrumental Rarities" in 1985. It then found its way onto Sequels' "Jumpin; Instrumental Diamonds vol 1" in 1990 where it was accompanied by "Gringo", and in stereo! That set also saw a welcome re-release for "Mick's Tune", but in a new stereo version that included some studio chatter on the front. During the 1970's a bogus group cropped up fraudulently calling themselves "The Fentones". It can be categorically stated that this outfit had no connection with Shane Fenton's excellent backing group. All these releases show a solid and confident outfit that laid down many more recordings than were actually released at the time. Since 1985 "Take Five" has been re-issued almost as many times as either of the groups' single cuts, but it is a worthy track which ably demonstrates the Fentones as a cut above the norm. Even the relatively poor quality of "Moon Dawg" that emerged from one of the group's rare recorded radio appearances (with Shane) is still heard to be full of energy and ideas, even in that one-take-only environment. Cuts such as "Teardrops", "Raucous" and "Caravan" are known to have been recorded at EMI, and rumour has it that more lie gathering dust in the vaults. If these were brought together with the four quality 1962 sides, plus alternate and/or stereo takes, all would compile into what would be an extremely interesting compilation. Indeed appearances in recent years at Shadowmania at Lakeside has re-affirmed their status among instrumental fandom that this was one of the finer instrumental bands of the early 1960's who deserved more than just two small-scale single hits.